Something seen through a window from a distance, misread and perhaps skewed by personal feelings, causes the grand tragedy presented in Atonement. It’s seen through the eyes of a child, the 13-year-old Briony—an imaginative, spoiled young mind. She’s the youngest in the Tallis family, a wealthy clan with a massive home on the English countryside. Briony sits at a typewriter when the film begins, putting the finishing touches on her first play, and so she is no stranger to embellishment for the sake of drama. She interprets a number of signs incorrectly, forcing onto them her own creative suppositions, and then she tells a lie, the results of which are devastating. Briony’s sister Cecelia (Keira Knightley) is on the verge of an affair with the groundskeeper’s son, Robbie (James McAvoy). The two seem so desperately in love, in a hidden adoration we see burgeoning under the surfaces of these actors’ faces. Knightley gives an elegant and passionate performance; we can see her strengths are more suited to romantic period dramas than swashbuckling pirate adventures. And McAvoy, who disappears into his every role, is once again a perfect chameleon; we would never suspect this is the same actor from both The Last King of Scotland and The Chronicles of Narnia. Knightley and McAvoy embody their parts so effortlessly that it hurts to see them separated; it is without question their characters are meant to be together. Robbie is a young man educated at Cambridge and virtually adopted by the patronage of the Tallis family’s father. He remains before the border of social elitism behind which Cecelia stands, but doesn’t fit with the underclass either. He is intelligent, attractive, surely no groundskeeper. As a result, their love might be frowned upon; at the very least unexpected. Unable to hide his secret any longer, Robbie writes Cecelia a love letter to tell her so. He gives his letter to the impetuous Briony to deliver, who of course reads it, and finds something more than a simple love letter, unintentionally sent, and interpreted by a child as scandalous. The precise circumstances under which Briony reacts, lies, and allows her older sister’s would-be lover to be arrested, I will not divulge here. It is enough to say that four years later Robbie finds himself enlisted in the British army, as opposed to serving jail time as an alternative, fighting in France against the Nazis. Cecelia is a wartime nurse. He and Cecelia are tragically separated, but both work toward the day when they’ll meet again. Briony, now older and a bit wiser, realizes the mistake she made in her jealous, misinterpreted accusation against Robbie. The 13-year-old Briony is played by Saoirse Ronan, a young actress whose long neck and pointed features keep an equally snooty, yet innocent naivety in them. The 18-year-old Briony is Romola Garai; her eyes bear a weight of guilt, one growing throughout the film and culminating when she finally tries to make amends. 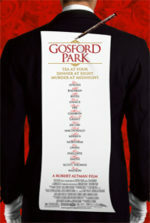 And finally, Vanessa Redgrave appears as an older Briony; her scenes show us how deep a wound a silly child could make. This picture is beautifully filmed by director Joe Wright (2005’s Pride and Prejudice) and his cinematographer Seamus McGarvey. An impressive continual shot takes us through Dunkirk beach, where Robbie moves about a chaotic array of other-worldly wartime imagery. We see idleness, fighting soldiers, animal atrocities, and a massive Ferris wheel, all shown in a background flourishing with an ever-present sunset. Computer-generated backdrops (and seamless branching?) aside, it’s a wonderful sequence to behold, challenging even Alfonso Cuarón’s audacious rescue scene from Children of Men last year. 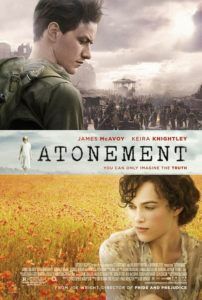 I cannot be sure if Atonement’s scene is real; its use of CGI makes it suspect. But that we cannot see where Wright has sewn the individual cuts, if they exist, testifies for the strength of the filmmaking. Most of the time, Wright’s direction maintains the story’s visual beauty; other times, his choices show how rookie a filmmaker he is (this is, after all, only his second feature film). Watch the scene where Cecelia looks in the mirror, which is intercut with Robbie bathing. While editing infers their connection, the repeated in-and-out focusing lowers this movie to something more contemporary. Same goes for the typewriter-based music, a blatant metaphor in a movie of otherwise subtle suggestion. Save for these examples, Atonement harbors classic, tragic storytelling, ending in a pensive study of guilt and conscience. 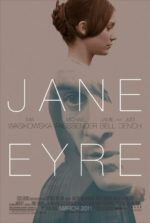 Working from Ian McEwan’s novel with an impressive faithfulness to the source material, screenwriter Christopher Hampton turns out yet another wonderful adaptation. He’s worked on The Quiet American (2002), Dangerous Liaisons, and Carrington, all to superb effect. Lasting is the impression that we’re watching a literary story told cinematically, but with an elevated sense of loyalty to McEwan’s book. Atonement is more than a simple broken love story; its turns surprised and devastated me by the final scenes. Wright holds extraordinary promise by drawing us in with his picture’s look and tone. I was reminded of classic British romances, specifically David Lean’s great Brief Encounter. Both are movies that use their iconic visuals and settings as deep-rooted metaphor and stir us with their captivating romantic tragedy. The final moments in each film mirror each other; though we so long for the protagonists to at last unite and leave us with a fanciful tale, we are instead given a harsh dose of reality.